With a stay at Bridal Tea House Hotel Hung Hom Winslow Street in Kowloon (Hung Hom), you'll be minutes from Hong Kong Coliseum and Hung Hom Star Ferry Pier. 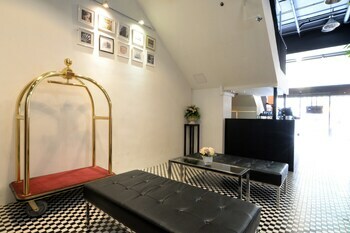 This hotel is close to Nathan Road Shopping District and Ladies' Market. Make yourself at home in one of the 76 air-conditioned rooms featuring refrigerators. Private bathrooms with showers feature complimentary toiletries and hair dryers. Conveniences include desks and coffee/tea makers, as well as phones with free local calls. Enjoy a satisfying meal at a restaurant serving guests of Bridal Tea House Hotel Hung Hom Winslow Street. Breakfast is available for a fee. Bridal Tea House Hotel Hung Hom Winslow Street is an amazing Kowloon lodging choice for your trip to Hong Kong. With numerous amenities for guests such as 24 hour front desk, non-smoking facility, you will wake up at Bridal Tea House Hotel Hung Hom Winslow Street feeling excited every day for your time in Kowloon. Don’t let this amazing reservation opportunity pass you by, book your stay at Bridal Tea House Hotel Hung Hom Winslow Street today to make the most of your time in Kowloon, Hong Kong.